Chandigarh: The family members of Sarabjit Singh were humiliated when they went to meet him and Pakistani authorities even wiped off the sindoor from his wife's forehead, his sister Dalbir Kaur said on Thursday amid outrage over the treatment meted out to Kulbhushan Jadhav's mother and wife. Dalbir Kaur said that Singh's family had gone to meet him in a Lahore jail in 2008. "We had no clue of the shocking things that were to unfold before our meeting with Sarabjit," Dalbir Kaur, who hails from Amritsar district, told PTI over the phone. Singh's wife Sukhpreet Kaur, his teenaged daughters Swapandeep and Poonam, besides Dalbir Kaur, went to Lahore to meet the Indian national for the first time in 18 years. The ordeal was similar to what Jadhav's family endured in Islamabad recently, according to Dalbir Kaur. Jadhav's mother and wife were stripped of their bindis, bangles and mangal sutra, made to change into different clothes and wear slippers by discarding their shoes. "Even before the meeting was to take place, the behaviour of Pakistani authorities was bad. A female cop took out a handkerchief and wiped out the sindoor from Sukhpreet's forehead. Both Sukhpreet and I were asked to take out hairpins as well. Sarabjit's teenaged daughters were also mistreated, and authorities were rude even after I raised objections. We were even asked to take out our kadas," Dalbir Kaur said. She recalled that as Singh loved "bharwan karela", a bitter gourd dish, the family cooked it at their home in Amritsar and brought it for him. "However, again the Pakistan authorities were rude. They opened the container and forcibly stuffed it into our mouths asking us to taste it first," she said. "Before proceeding to meet Sarabjit in jail, a manager at a Lahore Gurudwara asked us to keep our passports there. When we were to leave after the meeting, we were told to show our passports. When reminded that we had been asked to deposit these at the Gurudwara, the Pakistan authorities delayed our departure telling us that the documents were not traceable," she said. "I was the only one to be granted a visa. But this time too their treatment was no different. They took my kirpan forcibly and when I asked them to at least keep it safely, they flung it in some corner showing disrespect which deeply hurt my religious sentiments," she said. When I met Sarabjit, he cried a lot, asking me to help prove his innocence, she recalled. In 2013, Sarabjit's sister, wife and two daughters had again travelled to Lahore, but this time the distraught family were allowed just a glimpse from a distance of a comatose Singh who had been admitted to a hospital after a brutal assault in a Pakistani jail. He passed away barely a few days later. 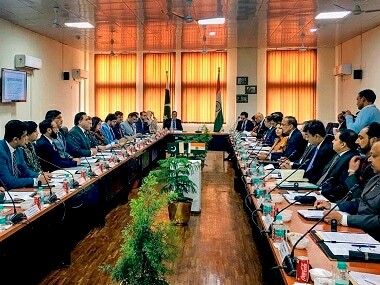 On the treatment meted out to the family of Jadhav, who is in custody in Pakistan for alleged spying, Dalbir Kaur said after playing a cruel joke by not allowing the family to meet the Indian national freely, Pakistan was now making baseless charges of a chip, camera or a recorder in the footwear of his wife. "First Pakistan portrayed the meeting of Jadhav's family as a humanitarian gesture, they then humiliated the family by asking them to remove bindis, mangal sutras and separated the family from him by putting up a glass screen. Now, they have come up with this baseless charge of the chip, camera etc. "I think India has responded as strongly and appropriately as it should in such circumstances. From now on, we should be even more firm towards Pakistan because they deserve such treatment and can only understand tough language," she said. 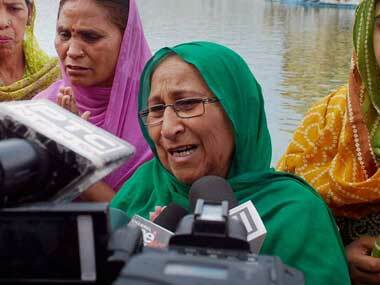 Dalbir Kaur's brother Singh had died following an assault by the inmates at a Lahore prison in April 2013. He was convicted of terrorism and spying by a Pakistani court and sentenced to death in 1991. However, the Pakistani government had stayed his execution for an indefinite period in 2008.